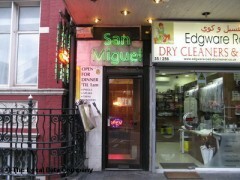 About: San miguels is a spanish restaurant and tapas bar the owners are from the region of Galicia in Spain and have bought this little corner to Edgware road food is all homecooked and outstanding service is great. Recommended. On point.... In an 80's early 90's sort of way. Still worth a visit but no live music on a Friday despite the information above, might of been a one off though. Not the worst restaurant we have been to, but it won't win any awards with that service. Place was hardly bustling, but we felt like we was intruding on our arrival. Everything seemed to be going fine with order and subsequent meal was delivered prompt, fresh and hot. Ironically one of the group was from Madrid and quickly realised we were being treated as comedy value by the two Spanish speaking waiters. We did think they were joking amongst themselves but soon realised it was about us. Unprofessional and rude. Food was acceptable and the wine was reasonable priced. We ate up and left quite quickly after being aware the derogatory Spanish comments being made/shouted at the bar was aimed us. Change the waiters we might return. My husband and I have been here on a number of occasions. Generally we have always left feeling rather satisfied & full. We have been on a Sunday with the kids & ordered paella & tiramisu for dessert. Waiters were rude. My friend booked a table for fourteen people for her birthday. The waiter told us off very rudely for bringing in a birthday cake rather than advising us that they did not permit food to be brought in from outside. This was despite us ordered lots of food and alcohol for the table. I feel they should have valued our custom seeing as we were the only people in the whole restaurant. None of us will be going there again due to this which is a shame as the food was delicious and the décor was lovely. I've been here a few times now on tastecard. It is always quiet when I have been during the week. Probably because this restaurant is quite well hidden. However I found the service friendly and attentive and the food delicious. I just wish more people would discover this place. I'm still not sure about the guy who plays the keyboard but the places certainly has charm. Food is superb and I found the service excellent. Every time I have been there it is a busy family restaurant with fresh well-cooked food and very friendly and attentive staff. This is a good place with genuinely nice people. Try it!